When you’re trying to make online casinos your entertainment, the word of the day has to be variety. In other words, if you’re trying to escape boredom, you need variety to see you through the many hours between now and your responsibilities. That’s where boredom usually strikes, because free time isn’t always a good thing. It’s better to have something to fill the hours with so that boredom doesn’t even think about bothering you. Yes, the HD does indeed stand for high definition. We’re suckers for good graphics, and the gameplay isn’t half bad either. Don’t worry, we’ll fill you in right here on this page! Cave Raiders HD is made by Nektan, a lesser known slot company that’s really been pouring a lot of focus in on great play and amazing graphics. 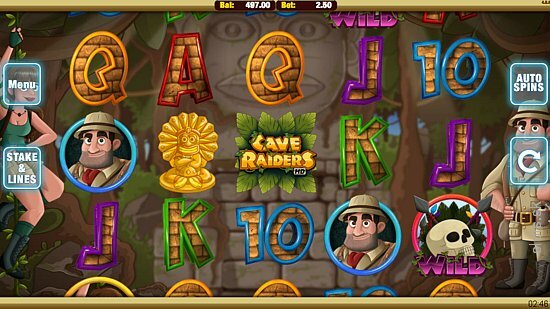 If you like action-adventure games, you’ll like this slot version that really can put money into your pocket. One thing that separates this game from other slots is that the generic “card value” symbols actually can still put a lot of money in your pocket, though not as much as the “featured” symbols of course. See, if you get all Js or 10s, then you get 80x your bet. Ks would give you 100x, and As give you 125x of your line bet. If you can grab five of the title logo symbols, you’re going to get 1000x the line bet. We picked this slot for you to check out because there are a lot of juicy prizes to win, and you’ve got scatters and wilds to also keep you company on the journey to profit. It’s up to you to see if you’re going to go for glory!